A few years ago, for Family History Month (which is this month!) I decided to make a migration map. I found a library online with historical maps. I chose one sort of in the middle of the time frame for my many migrations (the first being in the 1400s). 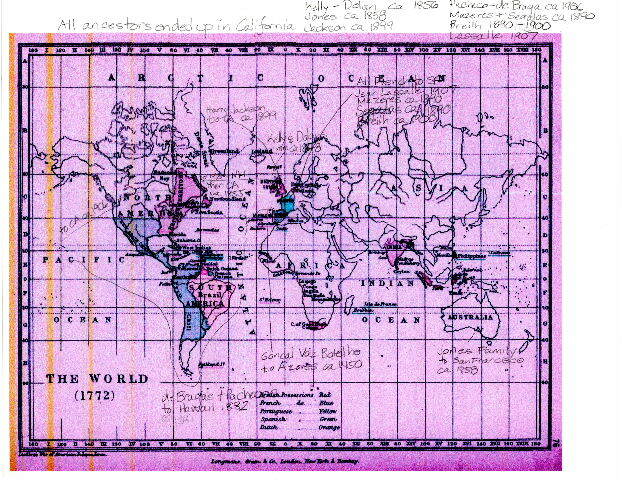 Then, I mapped out the migration roots of the families from Ireland, Australia, England, France, the Azores, and Portugal. Since I created this map, I have firmed up my data. Looking at this map, I can’t help but think of all the factors that had to come into play just so I could be born. A whole lot of people had to get the itch to migrate in order for me to be born. Unlike other genealogists, my ancestors were only in other states briefly (Hawaii, New Hampshire, and Massachusetts). They all converged on California, the San Francisco Bay Area to be exact, as their final destination. Once they got here they lived primarily in three places: San Francisco, Oakland, and the Salinas/Spreckels area. They began arriving in California in 1855. My last ancestor arrived in 1907. It seems crazy to think that if one of these families had decided to go to Iowa or stay in their home country, I might never have been born. Or, I might be speaking Portuguese, French, or some other language right now. Have you created a migration map? Does yours look like mine with all lines eventually ending up in the same place? Credit: Perry-Castaneda Library, University of Texas. 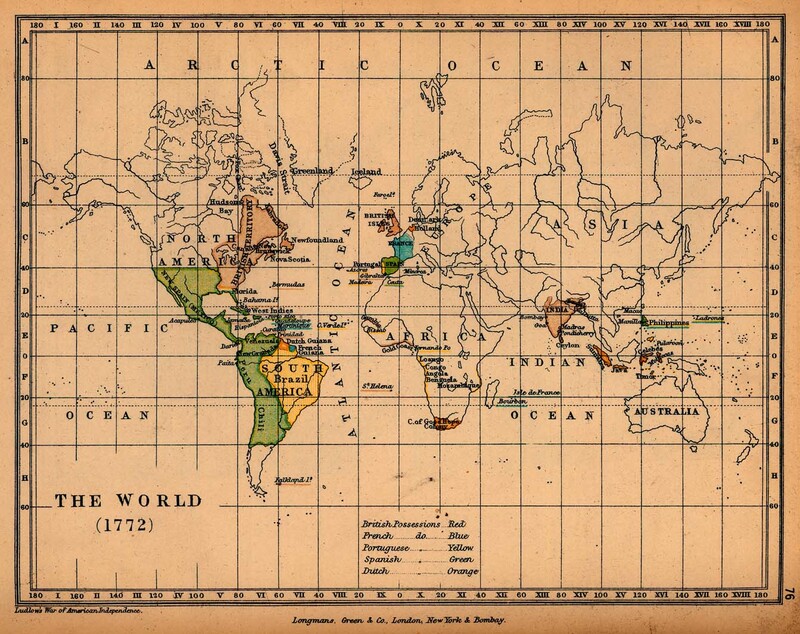 The World: 1772.